Rangeley is a real outdoors town. There is fishing, hiking, ATV riding and more. 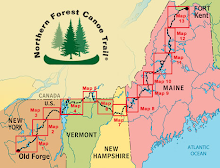 The Appalachian Trail passes nearby and the Northern Forest Canoe Trail goes through the heart of the town. Outfitters, guides, bookstores, equipment rentals, restaurants and even a photographer selling his work. Today many Appalachian Trail thru-hikers are here at the Town & Lake Motel. Northbounders who started in April or May are talking to Southbounders who started in June, exchanging information about "what's ahead". From the trail in 2009 while climbing over the Bigelow Range, took some pictures of the beautiful Flagstaff Lake. Soon I will be paddling there. It's a wonderful spot, the rain has stopped and nice weather is predicted for the next few days. Life is good.